The construction of the Vienna's fortifications was begun in the 16th century. Here at this location stood the Braun bastion, a defensive structure built in front of the city walls. The lower parts of the stone structures were reinforced by cut stone blocks. After 1857, the bastion was demolished and removed down to the street level. The remaining portions, that had reached down into the moat, were demolished in 1983 with the construction of the Parkring City Center, and partially rebuilt near its original location. Mit der Errichtung der Stadtbefestigung Wiens wurde im 16. Jahrhundert begonnen. 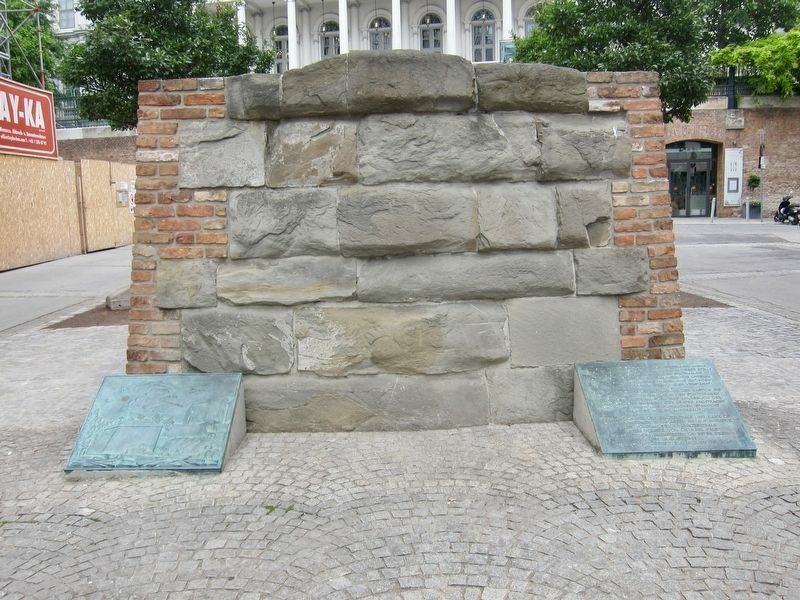 An dieser Stelle stand die Braunbastion ein der Stadtmauer vorgebautes Verteidigungsbauwerk. Die unteren Partien des Mauerwerks waren aus Gründen der Festigkeit durch Steinquader verstärkt. 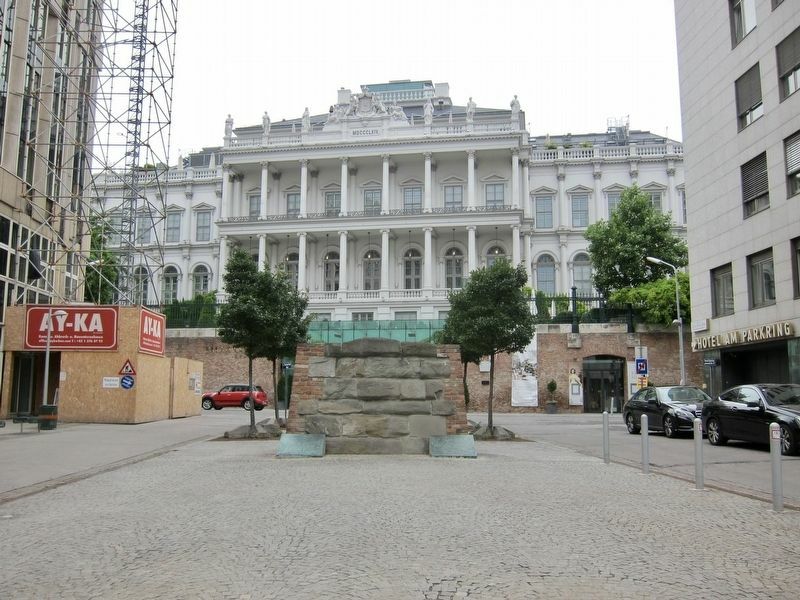 Nach 1857 erfolgte die Abtragung der Bastion bis auf der Strassenniveau die in den Stadtgraben reichenden Reste wurden 1983 anlässlich der Errichtung des Parkring City Center abgetragen und nahe ihrem ursprünglichen Standort teilweise wieder aufgebaut. Unter Patronanz der Girozentrale und Bank auf der Österreichischen Sparkassen AG. Auf Initiative des Vorstandes der Girozentrale unter Vorsitz von Dr. Karl Pale, gestaltet vom Architekten Dr. Peter Czernin im August 1985, der Öffentlichkeit zugänglich gemacht. Flanking the remains of the bastion are the marker (right) and and illustration of the bastion (left, see next photo). demolished and removed down to the street level. 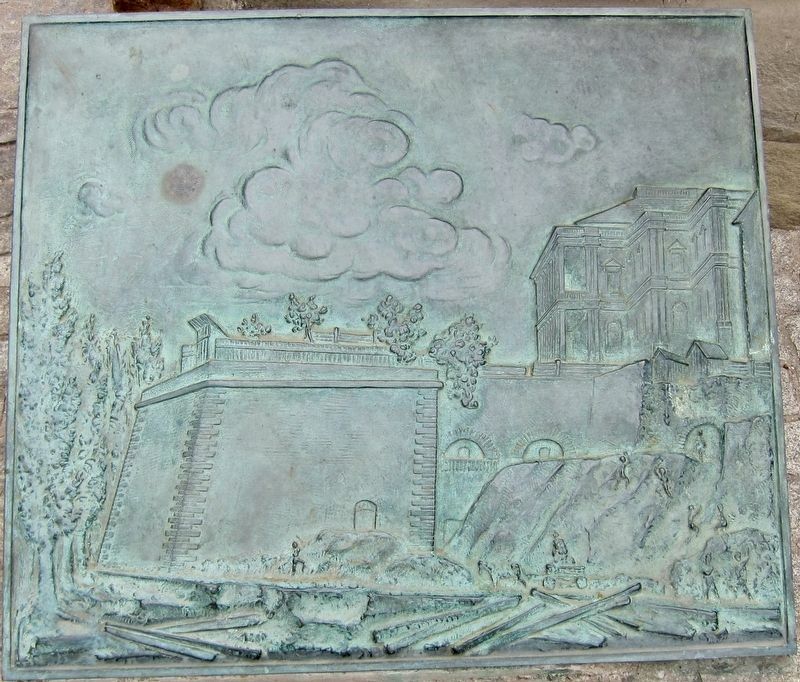 The remaining portions, that had reached down into the moat, were demolished in 1983 with the construction of the Parkring City Center, and partially rebuilt near its original location. Under patronage of the Clearinghouse and Bank of the Austrian Sparkassen AG. On the initiative of the Executive Board of the Clearinghouse chaired by Dr. Ing. Karl Pale, designed by architect Dr. Peter Czernin in August 1985, and opened to the public. Erected 1985 by Girozentrale und Bank auf der Österreichischen Sparkassen AG. Location. 48° 12.332′ N, 16° 22.635′ E. Marker is in Vienna, Wien, in Innenstadt. 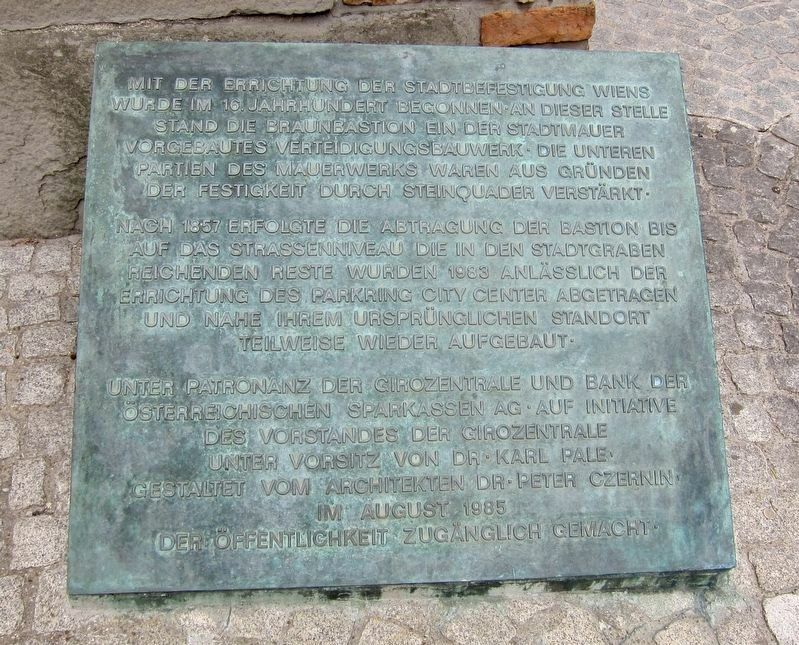 Marker is at the intersection of Gartenbaupromenade and Coburgbastei, in the median on Gartenbaupromenade. Touch for map. Marker is in this post office area: Vienna, Wien 1010, Austria. Touch for directions. (approx. 0.3 kilometers away); Lueger Denkmal / Lueger Monument (approx. 0.3 kilometers away); Dr. Otto Willmann (approx. 0.3 kilometers away). Touch for a list and map of all markers in Vienna. Looking west, with the Palais Coburg in the background. More. Search the internet for Braunbastion / The Braun Bastion. Credits. This page was last revised on January 26, 2019. This page originally submitted on January 17, 2018, by Andrew Ruppenstein of Sacramento, California. This page has been viewed 70 times since then and 4 times this year. Photos: 1, 2, 3, 4. submitted on January 17, 2018, by Andrew Ruppenstein of Sacramento, California.